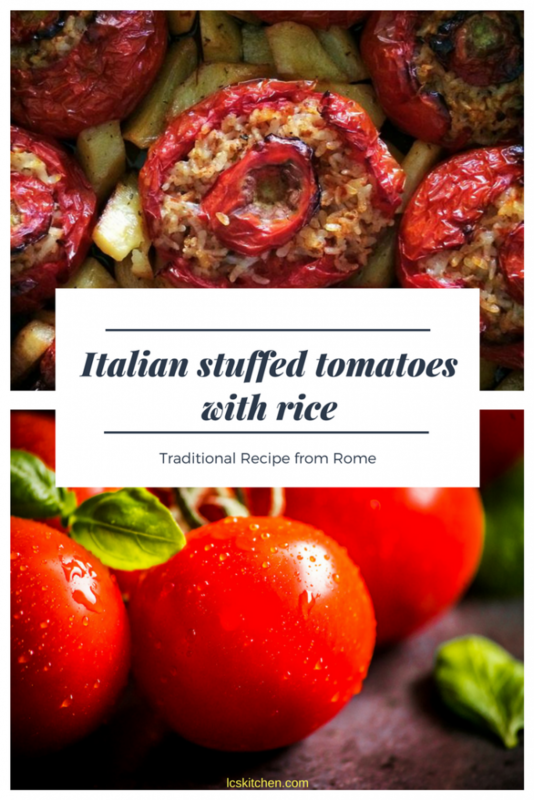 Stuffed tomatoes with rice is a must in hot weather, they can be served hot or cold and should be prepared in advance so the rice can soak up the flavors of the dish. For a complete meal serve accompanied by potatoes which are cooked together with the tomatoes following the classic Roman method. Even if traditionally, they’re served with roasted potatoes and the potatoes must be cooked together with the tomatoes; if you want, you can also serve these stuffed tomatoes without any further vegetable or with a salad. Let’s start with the basics: the best tomatoes to use are large, firm, red ones. The tomatoes mustn’t only be big and red but also firm otherwise when they come into contact with heat they tend to break up and lose consistency and liquid. Basil and garlic are added and last of all Arborio rice is used. It must be Arborio as other types tend to become overcooked and release too much starch. This dish can be eaten hot or cold but remember that the roast potatoes lose flavor when they are cold; it’s usually accompanied by stuffed zucchini. It’s one of those dishes you can’t say no to. The main variation of this dish, which is not traditional but it’s super good, is stuffed tomatoes with tuna: if you want to do both, remember not to cook the two different stuffed tomatoes together as the flavor will be compromised. Remember: the stuffed tomatoes with rice don’t have to be appealing… they only have to be terribly good! Bake at 180°C/350°F for approximately 45 minutes making sure that the cooking liquid doesn’t dry out. If it does add a little hot water.